This is Chak Allahabad in India on 10th Moharram 1435. What we tell you more, photograph says it all. You must have seen lot of pictures about Moharram procession this year, but you will not forget this picture. Last year picture of Karbala on Ashura realsed in media and we saw millions of people marching towards holy shrine at Karbala, Iraq. 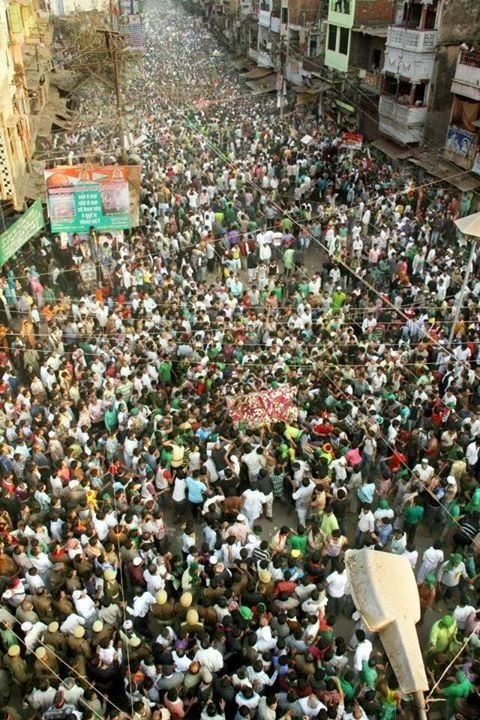 This picture has not millions momneens for showing but it certainly has thousands momneens on street of Allahabad, a old city of India's Uttar Pradesh (UP). If it is still any doubt that Azadari will be Continue till last momneen Alive. 10 Moharram 1435 procession taken out from Shia Jama Masjid Kashmiri Gate Delhi and heading towards Dargah Panja Shareef. It is one of the oldest Azadari Jaloos in Delhi since mughal period. A beautiful conversation between me and my ahl-e-sunnat friend on AZADARI. Me : Bhai aap 3 hi din Imam Hussain (a.s.) ka Ghaam main sh0k maana liya kareye 10 moharram (jaab Imam Hussain(a.s.) shaheed hue) auur 11 and 12 moharram. Me : Ab khuda ke liye ye maat kaheyega ki kisi ki YAAD maanana BIDAAT hai.....because Hazrat Ibrahim a.s. ki kuurbaani ki yaad aaj tak musalman maanate hai (eid-ul-azha)........to Imam Hussain(a.s.) ne bhi to Allah ke deen ko bachane ke liye AZEEM kuurbani di thi...........auur Allah ke Rasool (s.a.w.s) ne KARBALA ki BAASHARAT rookar apni umaat ko sunaiye thee. Me : bhai auur agar nafil namaz padhe ke, roza rakh ke, quran ki tilawat karke.....Imam Hussain(a.s.) ki karbala mai muskilaat yaad aa jaye to..........do aaaso nikalna BIDAAT to nahi hoga.....Kyuki Moharram mai yahi to hota hai. Me : I totally agree with you........Hum log bhi koi namaz, roza chod ke Azaadari-e-Imam Hussain(a.s.) ko saahi nahi samajhte. auur Namaz, rooze ke sath azaadari karte hai. hamare sab kuch chhodhne ki murad ye hai ki ham business, jobs, ya aur zuroori kaamo pe se tawajjo hatake ghame husain me shareek hote hain kyunki ye duniyawi cheeze hain ..
Sabkuch ka matlab hargiz wajibat aur mustahabat ka tark karna nahi, sab kuch se murad dunyawi lehwo laab ko tark karna hai, jisme aam taur pe ham roz marra zada waqt bitate hain..
Shia world must acknowledge this man's contribution for spreading Azadari. His golden voice again presented some excellent poetry of Rehan Azmi and other shayars in his new Nauha Album of 2013-14. Title Nauha ...Allah Main Rasil Hussain (AS)... give you some thoughts. Nauha on Bibi Sakina ...Baba Baba Hussain...will give tears in your eyes. Nauha on Hazrat Ali and Bibi Zainab will make you sad. Few words for his sons Ali ji and Shanawar: They are working hard and this year too we liked their Nauhay. On this page you will find their nauhay after Nadeem Sarwar's nauhay. Shanwar recited a english nauha this year, which is good try and a message for english speaking people to understand Imam Hussain and his philosophy of Islam. Ameer Hasan Aamir is one of the best Nauhakhawan of India. Every year he bring out something new through his album. This year his nauha album released early in comparison to leading nauhakhawan of Pakistan Nadeem Sarwar. In his new album Aamir is giving voice to poetry of Nayyar Jalalpuri, Asif Bijnouri and Shams Rizvi. This nauha of 1435 (2013-14) by Lakhani Brothers is tribute to thousands of shia brothers and sisters, who killed in Pakistan by Kafirs and Yezeedi forces. We condemn these killings by Al Qaida and Pakistani Taliban terrorists and salute to those martyrs. Karbala and Imam Hussain's martyrdom is more important for every shia, while we all are in grief and sorrow due to Shia Killings and nobody can stop Azadari. They are killing us, because we are doing Azadari. But they forget that till last Shia will remain on this earth, Azadari can't be stopped. This year we salute those Nauhakhawans and Shayars (poets) who are reciting nauhas on these topics. Here is one such nauha, and it's just started the Mission Azadari....at any Cost.